Thanks to Palace Films here is your chance to win one of 20 x in-season double passes to Just To Be Sure. Synopsis: When 45-year-old widower Erwan (the remarkable François Damiens, The Bélier Family) discovers by accident that that man who raised him isn't his real father, he begins a search for his biological one. Thanks to a local private detective he soon locates the mischievous, 70-something Joseph (Le Havre's Andre Wilms), whom his mother knew briefly. Erwan soon falls not only for his charm, but that of the impetuous Anna (a radiant Cécile de France), who has ties to them both. But the conflicting loyalties become compounded by the pregnancy of his own daughter, who defiantly refuses to name the father… very soon Erwan's families begin to collide, to unexpected, hilarious and moving effect. 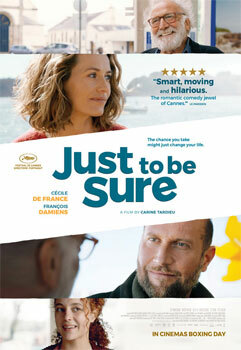 Just To Be Sure is a winning tale of parenthood, love and family, both lost and found.